Jemma grew up on a small holding and was involved in showing and breeding a large variety of pet and farm animals. She qualified as a veterinary surgeon from Bristol University in 2007 and volunteered as a vet in the Peruvian Amazon Jungle, before working in a busy mixed practice in West Wales, where she discovered her love of treating the more unusual animals that visit the vets. 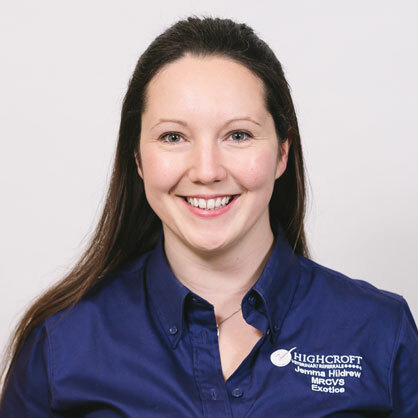 In 2009, Jemma joined Highcroft Veterinary Group. She gained her General Practitioners Certificate in Exotic Animal Practice in 2011 and was commended on her case reports. In 2016, she gained the Certificate of Advanced Veterinary Practice in Zoological Medicine, achieving merits and distinctions in most modules and the RCVS granted her advanced practitioner status. She has lectured to students, nurses, vets, owners and breeders and is devoted to improving the welfare of exotic pets. Jemma is an official veterinarian so she can complete pet passports for dogs, cats and ferrets and complete import and export certificates for other species. Jemma is also the veterinary advisor to Bristol City Council and has a role in veterinary inspections of zoos, pet shops, breeding establishments and dangerous wild animal licence applications.